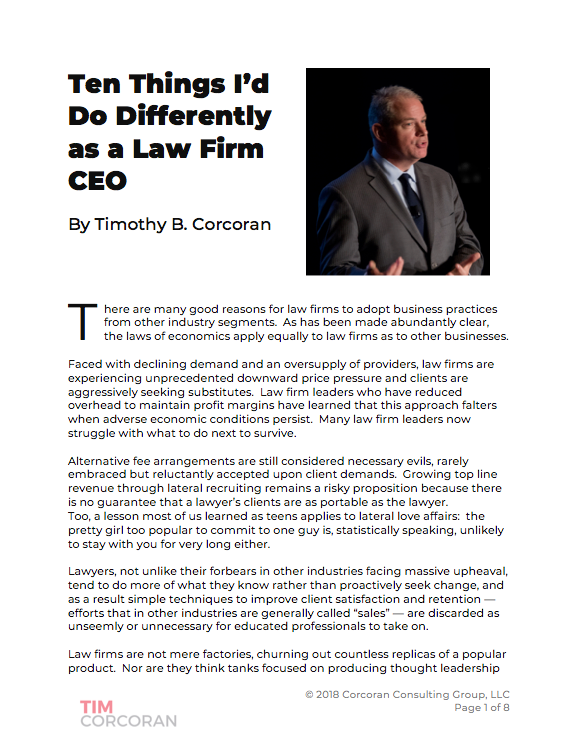 The dramatic economic downturn has affected law firms and their clients in equal measure and has rocked the legal market landscape. One of the results will be a change in how law firms develop new business and interact with clients in the future. In April, Altman Weil conducted a study of law firm leaders that focused on key areas of transition, including clients and marketing. This 90-minute webinar will draw on that data, as well as Altman Weil's hands-on experience to provide practical business development tactics that will generate business for your law firm. With the challenging economy, what was already a competitive market has now become even more competitive and strategic. We look at how the benchmarking concept has changed due to the economy and what we can expect in the future. Additionally, how the firm's financials and financial benchmarking are constantly communicated to the partnerships is changing as well, and we examine some best practices of technological transparency. Our clients are now creating joint and highly-structured initiatives aimed at closing the perceived gap between what legal services cost and the value clients receive from those services. As law firms develop responses to the value initiative, what role can technology play, and what technologies are available that increase leverage, lower cost or increase value? Practice groups are the key business units of law firms. Each group has its own market and its own competitors, and each should have a clear, effective road map for developing new business. Few do. This 90-minute Altman Weil webinar outlines practical strategies to target high-potential clients, craft the most effective selling strategy and close the deal on profitable new business, even in a challenging economy. Many marketing efforts fail at the last step – making the sale. Why? Because of failing to understand and address the prospective client’s needs. The best marketers in any industry know they need to be responsive to their customers’ desires. And when you can’t put yourself in your prospect’s shoes to understand what they want, you’re guaranteed to fail at landing new business. It’s crucial that you understand what will turn a business development opportunity into an actual client. The real secret of closing isn’t a magic word… it’s understanding your client’s needs, and addressing those needs. Client development is critical to your firm’s success, especially in this environment. And it’s something that every attorney should be actively engaged in – rainmaker or not.